HARMON, Guam — A week after Typhoon Mangkhut pummeled through the Marianas, residents are still in need of help as the try to rebuild their lives following the storm’s destruction. 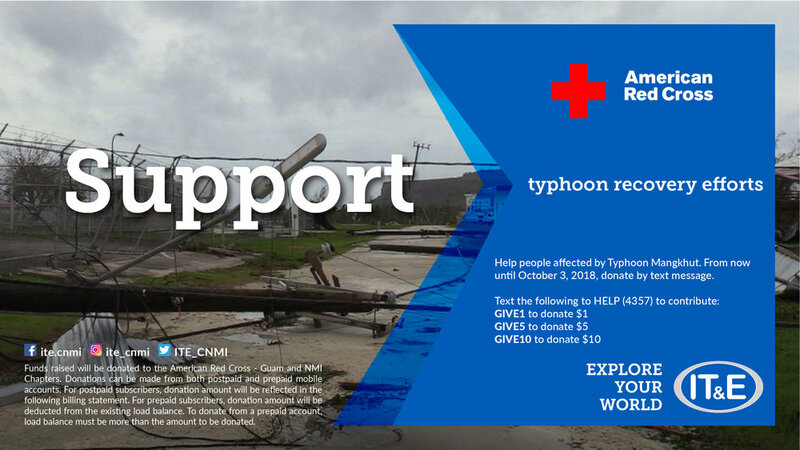 IT&E is working to help victims of the typhoon by opening a text-to-donate line, donating supplies, and extending September’s payment deadlines. After lashing Rota and Guam with heavy rains and sustained winds estimated at more than 100 mph on Sept. 10, Typhoon Mangkhut destroyed many homes, leaving hundreds living in shelter and waiting for aid to rebuild homes or looking for a new place to live entirely. Federal and local government agencies continue to assess the damage done to Guam and Rota. IT&E has opened a text-to-donate line for its subscribers to help give relief to victims of the typhoon. Funds raised will go to the American Red Cross NMI and Guam Chapters to help provide food, supplies, shelter, and much-needed services. The American Red Cross plays an instrumental role in offering housing assistance, providing hot meals and other necessities, and offering comfort to typhoon victims. The text-to-donate line is open until October 3. Every donation can help an individual, possibly a child, who is lacking basic necessities during this distressing time. IT&E management and associates in Guam and Saipan also collected and donated supplies, including non-perishable food items, batteries, diapers, toiletries, and 300 cases of bottled water to the American Red Cross to distribute to people affected by the storm. To encourage subscribers to focus their resources on recovery, IT&E is extending September billing for Guam and CNMI residential and business accounts from Sept. 15 to Sept. 27. As the Marianas and Guam take the first steps on the road to typhoon recovery, IT&E is remains committed to supporting efforts to improve the community and give help to those in need. 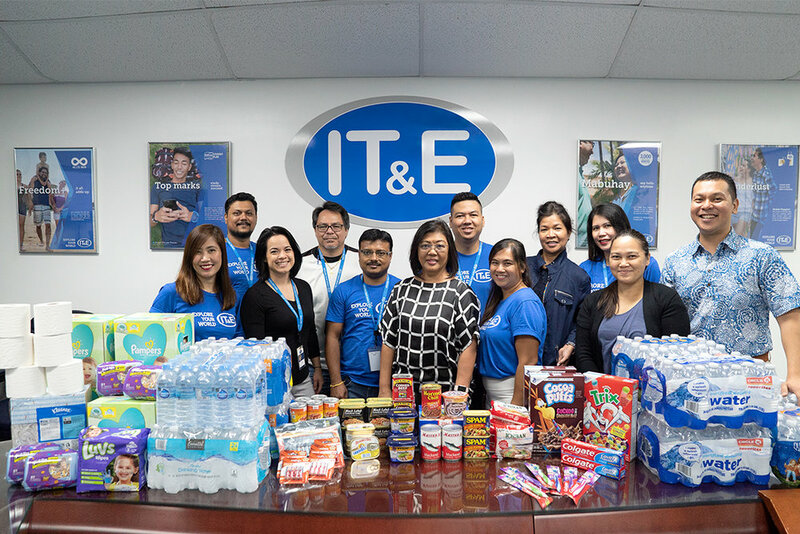 IT&E management and associates in Guam and Saipan donate supplies to victims of Typhoon Mangkhut in Rota. Donations include, non-perishable food items, batteries, diapers, toiletries and 300 cases of bottled water.